Samsung has announced the fourth phone in its Galaxy A series on Friday in India. The Galaxy A20 sits nicely between the A10 and A30 which were launched earlier in February this year alongside the A50. Samsung is doubling down on phone launches across various different price points just like some of its counterparts. As a result, consumers are getting more choices than ever, especially in the mid-range smartphone market in India. The A20 features a 6.4-inch HD+ (1560 x 720 pixels) Super AMOLED panel and has a waterdrop style notch on the top of the screen. With the Galaxy A20, Samsung has brought down an AMOLED screen to a much affordable price point which is a welcome move. It is powered by the Exynos 7884 octa-core chipset backed by 3GB of RAM and 32GB of storage. The storage can be further expanded by up to 512GB via microSD card. Samsung's Galaxy A range of phones are powered by Android 9.0 Pie under the company's OneUI experience and the A20 is no exception to that. The Galaxy A20 has a dual camera setup on the back consisting of a primary 13MP sensor and a secondary 5MP ultra-wide snapper. There is an 8MP camera on the front housed within the V-shaped notch for selfies. Powering the A20 is a 4,000mAh battery which supports 15W fast charging. Additionally, the phone also features a fingerprint sensor on the back panel. 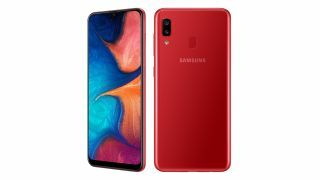 Samsung Galaxy A20 is priced at Rs 12,490 and comes in three colours- black, blue and red. It will go on sale for the first time on April 10 across Samsung India e-Store and Samsung Opera House along with online and offline stores.